In 1897, the wild rose was designated as the official state flower of Iowa. The selection was made based more heavily on a silver service than anything else. The silver service presented to the battleship USS Iowa in the same year was patterned with wild roses, which prompted the selection of the flower. No specific version of wild rose was ever selected by the state, so most commonly the wild prairie rose is considered the state flower of Iowa. The wild roses found throughout the state of Iowa bloom starting in June lasting through the late summer. The pink flowers vary in shade and have a soft yellow center. The wild prairie rose has five notched petals around the center in a single layer. The prairie rose grows wild throughout the state in low shrubs with bright green foliage. The hardy shrub is native to all of the prairies in the United States. The roses that grow wild in the state reach up to eighteen inches in height. The stems are heavily covered in thorns but the fragrance of the flowers is appealing. The roses tend to appear along roadsides and woodland edges and are especially fond of areas where intense grazing and wildfires have occurred. The rose hips of the wild prairie rose are edible and are often used in teas and as garnishes. 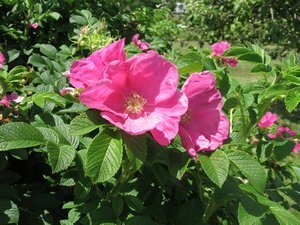 Wild roses are easy to grow and require almost no maintenance. After all, the bushes grow in the wild easily and produce beautiful flowers every summer. Plant wild prairie roses as a plant, not a seed, and then leave them be once they are established. The plant will die out in the winter, but the stems will start new growth in the spring showing you were to cut off the dead portions. The roses will continue to grow and thrive over time creating a lush, beautiful addition to any garden. This entry was posted on Wednesday, July 21st, 2010 at 6:19 pm	and is filed under American Flowers. You can follow any responses to this entry through the RSS 2.0 feed.